This year I'm making yet another attempt to observe the Nativity Fast. During this fast one cannot eat anything of animal origin. That means no omelette until Christmas (! ), no milk in my morning coffee (!! ), no butter on a toast (!!! ), and no roasted chicken. :( Imagine how challenging it is for a person who just loves all of the above. Wish me luck! But lack of favorite food makes one invent something new to please the palate and tame the constant hunger and cravings. 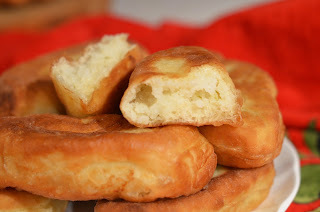 Today's recipe is strictly vegetarian: there are no eggs or dairy in the dough and the fillings. 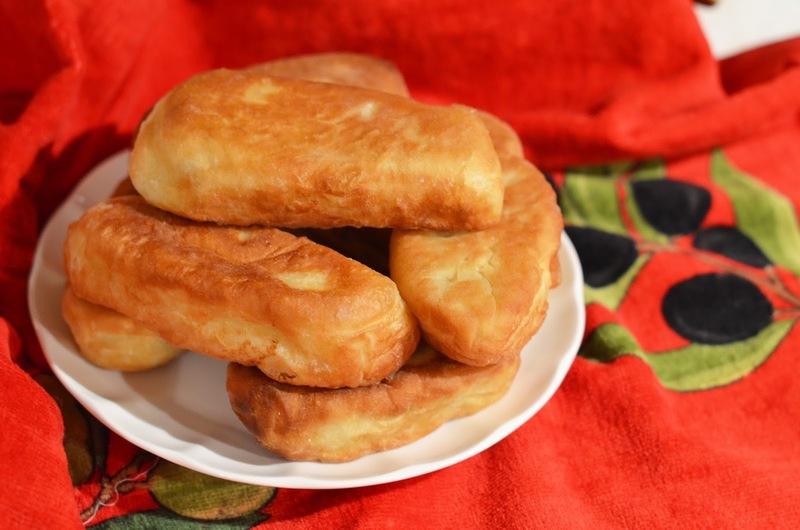 The result was unexpectedly satisfying: the dough turned to be light and soft and airy, and the overall feeling in the body was far from usual heavy feeling after consuming traditional yeast dough pirozhki or belyashi. Today I made two fillings - mashed potato and mushroom-zucchini. You will also need olive oil for baking/frying and a good skillet (wrought iron works best). 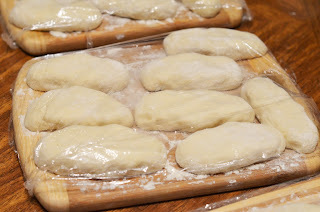 Time: 2.5-3 hours (largely depends on how fast you move working with dough and "pinching" pirozhki). Warm water in a preferably enameled (or any non-reactive metal) pot, stir in sugar (water should be warm to the touch, but not hot). Take 1/3 cup of this water and mix in the yeast, set aside to rise. While the yeast is "waking up", add salt and oil to the water. When the yeast is all foamy, pour it in the water mixture, gradually add flour. Stir the dough with a spoon (or a mixer!) or just mix and knead with your hands to make a sticky dough ball. Cover the dough in the same pot and put it in a warm place to rise. It will take about 1 hour, depending on the temperature of the room and the quality of the yeast. For the potato filling, boil potatoes until very soft (salt water when they start boiling). Saute one onion until translucent. When potatoes are soft, drain water reserving about 1/2 cup of it. Mash potatoes, add onions, white pepper and 1/2 potato water that you reserved, adjust salt. Mix well. For the mushroom-zucchini filling, saute onion in olive oil for 5 minutes, then add mushrooms, continue to saute for another 5 minutes on medium heat. Add zucchini, leek, garlic, salt and pepper. Cook 5-7 minutes, until everything is soft and there is no liquid on the bottom of the skillet. Set the fillings aside to cool. By the time you prepare the fillings, the dough should rise well and triple in size. At this point you can start working with dough. 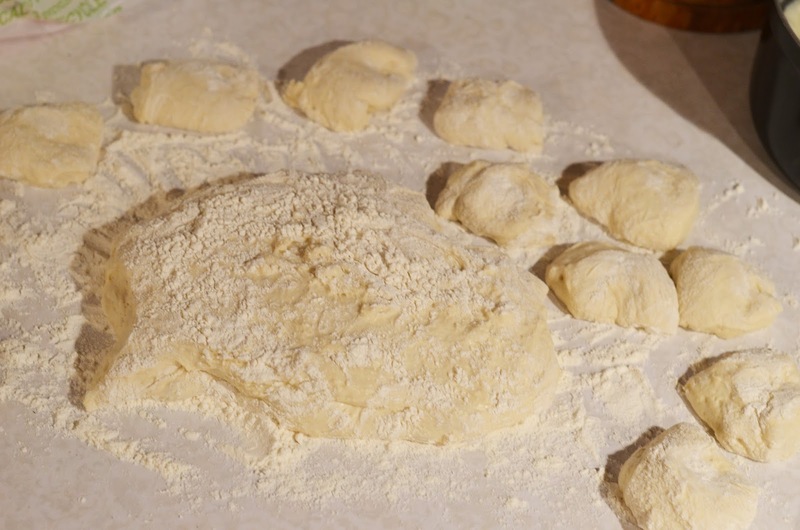 This dough is very soft and sticky, so you need a lot of extra flour to work with it. Generously flour the surface, transfer all dough on the flour, and dust it with flour all over. Work with floured fingers. 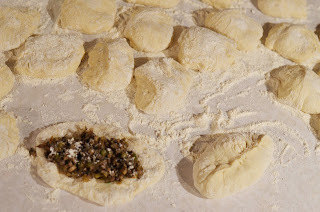 Cut the dough into pieces, about 2.5"x 2.5", dip each piece in flour and place apart from one another. With your fingers, gently work out a dough oval out of each dough piece, about 3"x 4" in size, it shouldn't be perfect. Work in batches of 4-5. 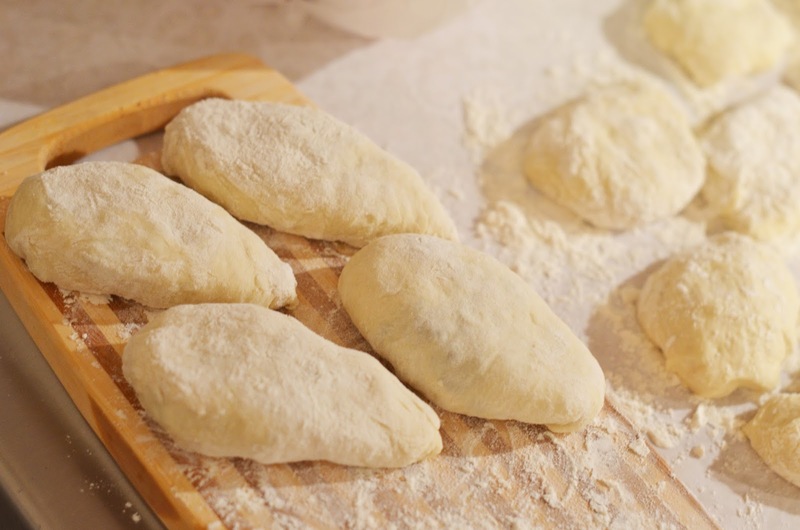 Place the filling in the middle of each oval (about 1.5 Tbsp), slightly dust it with flour and pinch the sides together to form a pirozhok (singular from pirozhki). Place pirozhki, the seam down, on a floured surface. It's better to make all pirozhki and cover them with plastic film before baking/frying, so that you are not destructed later. Heat the skillet on medium heat, add oil and heat it, too, for a few minutes. 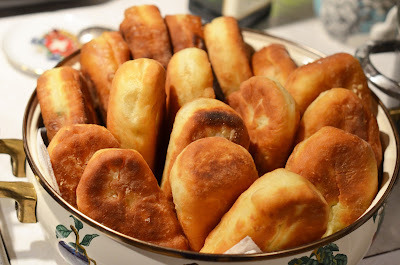 Ideally, the oil must cover pirozhki up to the middle of the side, but it can be less (in this case you will need to also brown the sides and tips at the end - this is what I did). 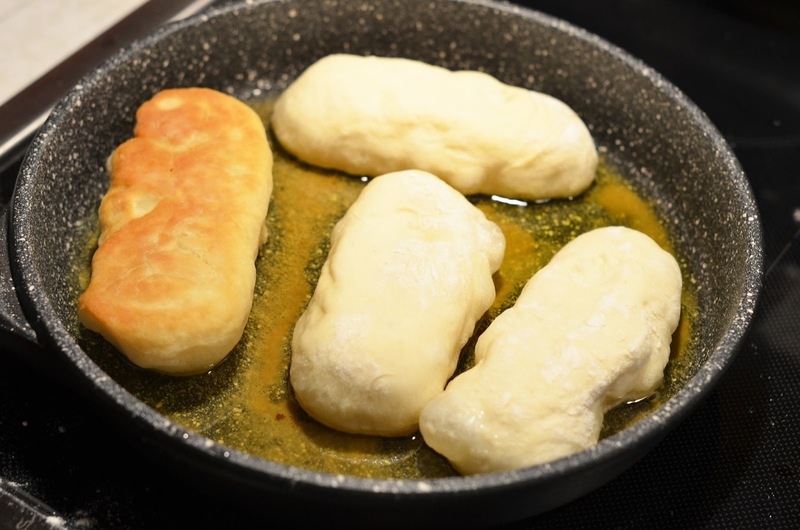 Gently transfer a few pirozhki (the seam down) onto the skillet, they should not touch one another. Fry on all sides until golden (tongs are very useful in the process). Transfer ready pirozhki in a pot lined with paper towels. Serve warm with butter (if you are not on a fast!). Happily consume and feel the difference. 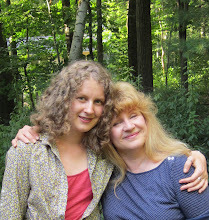 The texture is so soft and airy, with delightful crunchy outside. Enjoy! This amazing dough was almost equally good on the second and third day! If you have leftover pirozhki, keep them covered and refrigerated after they cool.